Open your soul to the heart of Mexico and live a breathtaking luxury experience fully accommodating to the vegan lifestyle. This iconic Resort, located on 400 scenic acres on the southwest point of the Riviera Nayarit region, will offer you the most incredible Four Seasons feeling with vegan delights. The breathtaking blue vistas of the Pacific Ocean, the authentic Mexican-style casitas, and the lushness of the surrounding nature, in addition to an extensive variety of plant-based options, truly makes Punta Mita so special. The Four Seasons is already revered for its exceptional level of service, but the Punta Mita Resort enhances this level of luxury through the added natural experience they provide to their guests. Not just great facilities, expansive spaces, typical Four Seasons world class service and charm; but when it comes to the Dining experience, total delight will happen thanks to the three alfresco restaurants with ocean views and vegan options. Led by executive chef Jorge González, the Four Seasons Resort Punta Mita’s culinary program offers distinct culinary creations infused with unrivaled Four Seasons luxury and peppered with an authentic taste of rural Mexico. Aramara, Bahía and Dos Catrinas are the names of the three Restaurants available here. Casual elegance, relaxed atmosphere and contemporary Mexican design. You pick according to the mood of the day or indeed the moment. Whether relaxing with a drink at a pool lounge or savoring one of the signature dishes, guests are guaranteed culinary vegan pleasures. Californian celebrity Chef Leslie Durso has created for all restaurants outstanding plant based dining options boasting fresh local ingredients with an Asian twist. Avocado, cucumber, tofu, tapioca, radishes … the plant-based plates are truly a treat. At Aramara there is also a whole ‘harvest’ section within the mains. Leslie Durso is a Southern California native with Italian origins which led her to have the inspiration for simplicity coupled with tantalizing tastes. She lets the ingredients speak for themselves. Leslie’s signature dish is the ‘Portobello Zarandeado style’ which is Achiote and citrus marinated, avocado, chayote slaw, flour tortillas with vegan mayonnaise. Delicious! But the dish I still dream of at night is the “Fried Heart of Palm Rings”. Imagine tasting these light, crispy rings of deliciousness while sipping a refreshing sangria or even Punta Mita’s signature smoky Mezcal cocktail infused with watermelon and chilies, all amidst the simple soundtrack of the ocean’s waves. Welcome to Paradise. Yes, for vegans too. When I tried Planta it was a ordinary monday evening at 6,30 and it was almost packed . That surprised me a lot… what does it happen on a Saturday night? As soon as I tried their food and enjoyed the super efficient service I realized the reason of such a great success. 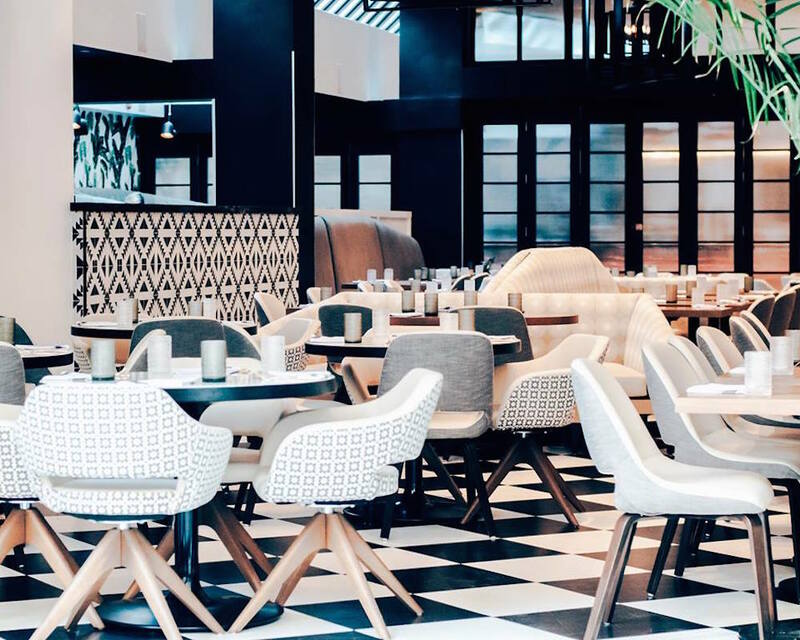 This lovely spot in Toronto celebrates innovative cuisine without the use of any animal products and its cuisine, captained by talented Chef Michael Parubocki, truly delighted my non-vegan friends. The restaurant’s vision is to celebrate innovative cuisine in a beautiful environment without the use of any animal products. I loved the water with fresh lemon slices filled in your glass faultless and the full attention of the staff. But the food is the big deal here. You have a lot of choices. You can enjoy their pizza and snacks as well as their amazing large plates. My love goes totally for their crab-cakes. They are illegal! I love Planta to the moon and back.